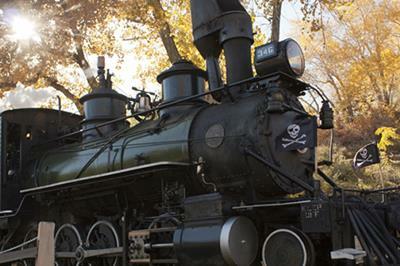 It’s full steam ahead for tricks, treats and trains! 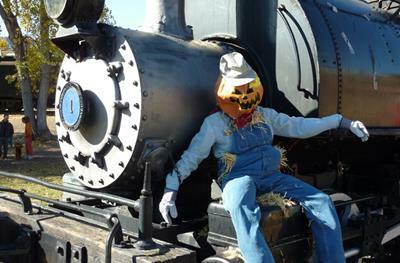 The Railroad Halloween Town is a safe place to enjoy Trick or Treating. Catch a ride behind a historic Denver & Rio Grande Steam Locomotive in vintage passenger cars hosted by conductors and engineers in full costume. Visit all of the special stops with your treat bags and tickle your funny bones including the “not so spooky” Haunted Railcar and the Olde Railroaders Silly Graveyard. Enjoy local food, kettle corn, shaved ice and even get your face painted. Finally, get a great picture of your costume as you pose in front of our Pumpkin Patch cart. Get professional fall portraits by Mama Chicken Photography. Admission includes unlimited rides on our Steam Engine as well as entertainment throughout the grounds. We will be open to the public from 9AM-5PM with entertainment and events running 10AM-4PM. Thanks to our sponsors & partners: Visit Golden, SCFD and All Support All Computers.